This Is Our Brand New Jewelry Cabinet Which Is Perfect For Any Woman. It Features Six Different Drawers That Offer Space To Store All Of Your Valuable Jewels Safely. It Also Has A Lift-Top Lid With Mirror And Divided Compartments To Keep Things Organized. The Jewelry Armoire Also Features Two Swing-Out Doors Fitted With Eight Necklace Hooks With Holdbacks To Prevent Tangling And Knots. Super-High Stand Design Can Prevent Jewelry Dampened And Moulded In Wet Weather. 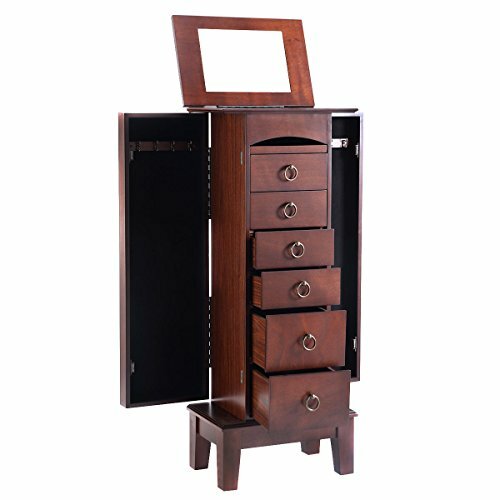 If You Are Looking For A Jewelry Cabinet, Don't Hesitate To Buy It! • Nice Design: It Features Six Different Drawers That Offer Space To Store All Of Your Valuable Jewels Safely. • Storage Space:It Also Has A Lift-Top Lid With Mirror And Divided Compartments To Keep Things Organized. • Nice Material: MDF.Super-High Stand Design Can Prevent Jewelry Dampened And Moulded In Wet Weather. • The Jewelry Armoire Also Features Two Swing-Out Doors Fitted With Eight Necklace Hooks With Holdbacks To Prevent Tangling And Knots.